The effects of current economic and demographic pressures on care and support systems are well documented. The need to do more with less is an established requirement of new models of care. However, there are significant barriers to the innovation of new ways of working in care delivery. 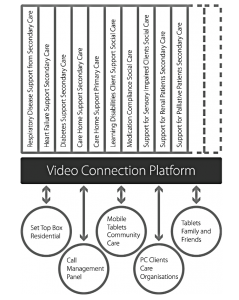 Some of these barriers will be described through the experiences of one of the authors (AH) in deploying video conferencing to support people in their own homes or in a care environment. The current use of video in care delivery is predominantly clinician-to-clinician communication between care organisations. Established examples are stroke or cancer networks. When developing a strategy for deploying a video intervention targeted at people in a residential environment it soon became clear that there was not a precedent to follow. In terms of Porter’s Five Forces the intervention was neither a new entrant to an industry that already exists or a substitute for a current product. Clearly any adoption of the video approach was going to disrupt internal systems in the care organisation and result in changes to practice. From a resources and capabilities point of view any strategy to deploy video requires close collaboration between the resources of the care organisation and the video service provider. This is a challenging engagement for care providers as they are more accustomed to transactional approaches where products or services are bought to a specification. Hence, each video deployment required sensitivity to the resources and capabilities of the customer and a collaborative approach to lowering the barriers to use of the technology. For example, modifying the user interfaces of the video conferencing equipment could lower some barriers and this has been done extensively to improve the experience of the people receiving care and of the clinicians providing it. A further challenge to any deployment of video conferencing is the initial modelling of the economic benefits. As each deployment creates a network of contacts there is no template for a specific intervention. Within health care, each disease, e.g. diabetes, has its own ‘silo’, i.e. has its own care pathway, its own specialists, seeks its own technical support and is evaluated in terms of its ability to meet disease-specific outcomes. Engaging with a particular silo is very dependent upon the context of the engagement and each deployment raises its own challenges. Therefore, before video can be deployed in the residential environment its benefits and cost effectiveness within current siloes of care have to be proved.